« Get Your Health on Track! Smoking is a major risk factor for heart disease. Smoking harms nearly every organ in the body including the heart and blood vessels. The nicotine in smoke raises your blood pressure, speeds up your heart rate, harms the inside of your blood vessels and reduces the amount of oxygen your heart gets. Every cigarette you smoke makes you more likely to get heart disease. Any amount of smoking, even light smoking or occasional smoking does damage. Roughly 1 out of 5 deaths from heart disease is directly related to smoking. How does quitting smoking help? Your odds of getting heart disease or high blood pressure will drop. 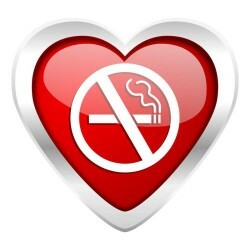 After 1 to 2 years of not smoking, you’ll be much less likely to get heart disease. You’ll feel so much better physically and psychologically and, you’ll be so proud of yourself for breaking the habit. Isn’t it time YOU considered quitting? We will support and work with you when you need it the most. Call Calgary Laserworks today for options and information about how laser treatments can help you quit smoking.